If quotes on images are to be believed, the most evil man from the last century was a Christian, while the smartest was an atheist. I might eventually dig up sources for those quotes and update this post, but today is not that day. 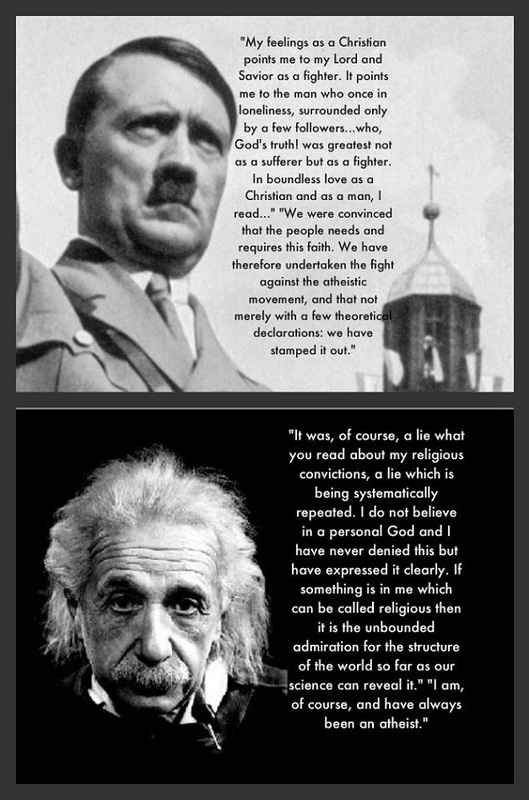 Does it mean anything for the truth of Christianity or atheism that Hitler was a Christian and Einstein was an atheist? Of course not! At most, it says that very intelligent people are atheists (but not exclusively intelligent people, and not all intelligent people), and that Christianity does not guarantee morals and can be used to support acts of genocide. Whether that requires great twisting of Christianity is an argument I shall leave alone for today, especially as I see good reasons for both sides. As you may have noticed, I did not post yesterday. I have decided to drop down to a Tuesday/Thursday posting schedule for a time. This is a compromise between what I wanted to do this week, which is take a hiatus, and what I know will happen if I do that, which is never return to this blog. I’m hoping giving myself this break from trying to post something every day will give me more time to take care of myself, work on other projects, and improve the quality of the posts I do make. This blog was never meant to be a collection of atheist images and links to other places with little commentary. It was meant to be full of posts like this one and this other one and this series, with very occasional pictures of craft projects. I have lately strayed from that goal, and am pretty disappointed with myself for that. Yet I know that if I once give up, if I let myself stop posting for a week or two, I will lose sight of the goal so completely that I’m more likely to start all over than to continue this blog. It has happened too many times before.